Virtually all the North American Carriers have deployed security infrastructure to protect their networks as the frequency and sophistication of attacks has increased. However, more and more Carriers expressed interest in turning around those solutions, as they migrate them to NFV and SDN, to make them customer-facing and offer security services to their enterprise customers. Particularly, we discussed the increased awareness in the mid market enterprise and even SMB who are waking up to the fact the Fortune 500 companies have already accepted. They must protect their businesses. I used the example of an auto dealership to demonstrate the value of SMB to hackers. A typical dealership is a $3-4M business with 30 or less employees. It’s a reputation-based business, where many dealerships are family-run and passed down from one generation to the next, so reputation of the family business is imperative. In addition, auto dealers maintain lots of personal data on their customers. SSN, address, phone, credit history, and bank account numbers are all collected by the dealer. In this environment, multiple studies show that dealers are falling prey to hackers because they are too small and unsophisticated to protect their dealerships themselves. This is exactly the type of business that Carriers now want to bundle the connectivity service they already sell to the dealership with a managed security service to protect the reputation and sensitive information of the dealership. Having a Carrier manage this service for the dealer is very valuable since the average dealer has a single person IT group. As one local dealer I spoke to on this said, he cares about three things: selling cars, making money, and selling cars. Here’s a great example of the type of business who needs managed security so it can go back to doing what it does best, and Carriers are now recognizing the opportunity. 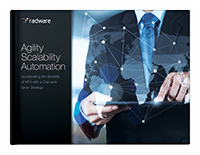 Read the eBook “Agility, Scalability, Automation: Accelerating the Benefits of NFV with a Cap-and-Grow Strategy” to learn more.